Last night, while laying in bed after reading a book, Harvey said he would like to take a golf trip with me and that I could hand the money to the people. I told him that sounded like a good plan, and would be great. I also asked if mom and Carson could come, and he said yes. This entry was posted in Harvey, Our Experiences on 13 September, 2017 by Chris. Often, when I hold Harvey and he faces me with his head resting on my shoulder, he lightly pats my back with his hand. I don’t think he even knows he’s doing it. This entry was posted in Harvey, Our Experiences on 11 September, 2017 by Chris. Carson is talking more and more, and stringing words together. And he has the ability to focus and say things repeatedly; especially on longer car rides. Imagine listening to a 2-year-old say, “Tao” (i.e., Cow) hundreds of times on the way to getting ice cream. It’s one of those things we’ll soon miss. This entry was posted in Carson, Our Experiences on 11 September, 2017 by Chris. In late June, I watched mom and dad try Nutrisystem and both had outstanding results. So, I decided to try it and, after following it meal for meal and snack for snack with no exceptions for two months, I’ve lost right around 30 pounds – down to 183 from 211. 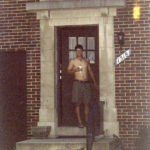 My initial goal was 182, which was my weight when I started at the University of Michigan in 2000 (see reference picture to the right, of me standing on my doorstep at 1518 Golden Street). Over the years of working, law school, and more working, the pounds had slowly added on. It was a combination of lack of exercise and poor eating (like downing some Cinnamon Toast Crunch each evening, where “some” was limited by the bottom of the box!). 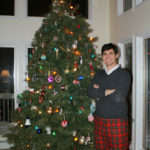 As a result of my weight loss, I’ve recovered a few suits, some other clothes, and most importantly, my Christmas pants (see picture). And, I just feel must better. I would recommend the program to anyone. After a couple weeks of adjusting to the smaller portions, I had no issues with the plan. The food was varied and generally good. My favorite breakfast item is the waffles, on which I put peanut butter, fresh blueberries, and a little sugar free syrup. I have about one month of Nutrisystem food left, and hope to get to a range between 175 and 180 (a little below the upper end of my BMI calculation). I’m also trying to dedicate more time to working out (both lifting and cardio), as that will continue the good habits. Just wanted to write and share this, so that I remember that it’s possible to try to loose weight, and actually do so! Side note: today is my 36th birthday, 17 years after the start of college! This entry was posted in Food & Drink, General, Our Experiences on 1 September, 2017 by Chris.